Despite these limitations, here’s a rundown of what was served. Sunchoke panna cotta with sea urchin and lime, paired with Finback Family, a saison brewed with bitter almond seed and lemon zest. 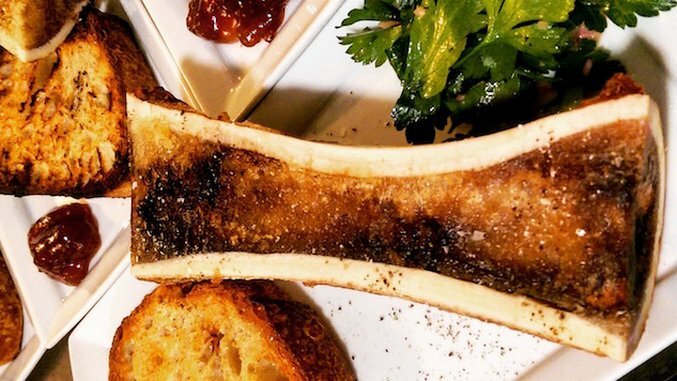 Bone marrow on toast with orange jam, paired with Finback Double Sess(ion) Wit, brewed with Szechuan peppercorns and ginger – the best beer of the night, by bar, with all the flavor of the peppercorns but just the hint of that famous mouth tingle. Crab cakes over rehydrated corn and pomelo, paired with Finback Crescent Fresh IPA. Osso buco with cranberry bean, paired with Finback Water on Mars, a red IPA. The cheese course, a goat button that was washed with Finback Red daily for two weeks, paired with the cranberry sour brew. And finally, a Mekelburg’s take on s’mores, paired with Finback Extra Coffee BQE made with local cocoa nibs and coffee. This dinner, and the beer that went with it, was something to remember. Alicia and Daniel are all about the beer, and you will mostly find local brews from microbreweries based in NYC and the surrounding area on tap behind the bar. Alicia looks at pairing and cooking with beer as sort of an everyman’s alternative to wine. “It’s kind of the beauty of beer: not only its versatility, but also its affordability/accessibility,” she told me. “You can explore a palate of different beers with a variety of foods without breaking the bank. With wine it can often get expensive. With beer you can have a glass of this, a taste of that and, chances are you’re not paying $10-$12+ per glass.” She also credits the brewery explosion in the city as being both inspiration and catalyst for her cooking. You can pretty much find every type of beer being made across the U.S. these days, from gose to sours to lager to pils to a local version of the classic Berliner-Weisse, all of which Alicia will cook or pair with. For the Mekelburgs, putting together a beer and food pairing menu brings to mind the age old “chicken or the egg” question. “Daniel and I are always bouncing new dishes off of each other,” said Alicia. “Sometimes we hear a description of a beer and say, ‘Yes! That osso buco dish will go perfect with that beer!’ Then other times we hear the description of a beer and say, ‘Can we wash some cheese in that?’” In other words, sometimes the food inspires the choice of beer, and other times the available beer will dictate the dish. Either way, the results are some pretty spectacular culinary creations. And you can mimic those spectacular results at home with just a little bit of advice from the pros. 1) Use it in your batter. Beer is a great way to get an incredibly crusty, light and flaky fry. 2) BRAISE BRAISE BRAISE!!! Short ribs, lamb, chicken thighs…. Use beer in your braising liquid – porters, ciders, pilsners. They add such a complexity of flavor to your dish. 3) Sweet tooth? We’re currently pouring The Bruery’s 8 Maids-a-Milking. It’s kinda amazing with a scoop of McConnell’s Turkish coffee ice cream or a homemade crème fraiche gelato. 1) Consider the flavor of the dish (or beer) and think about what you want to do – accentuate, contrast, compliment – and then make and taste. 2) There are the obvious combinations, like dark beers and sweets. I like contrasting flavors. For example rich, fatty foods with bitter, hoppy beers that cut through and refresh the palate; maybe sweet desserts with sour beers; hoppy, floral beers can work well with cheese. 3) I think drinking a lot and eating a lot is important.